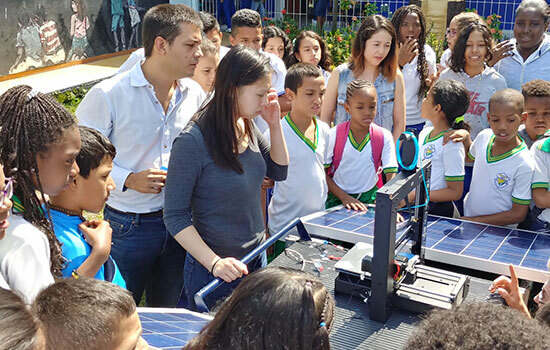 An RIT team of engineers demonstrated how to use a solar-powered 3D printer to a crowd of Colombian elementary school students in May. Rochester Institute of Technology received two grants from the 100,000 Strong in the Americas Innovation Fund to provide students new study-abroad experiences in Latin America. The grants will partner RIT with universities in Lima, Peru, and Cali, Colombia, and were awarded by the U.S. Department of State, Partners of the Americas and NASFA: Association of International Educators. The Innovation Fund awards provide $25,000 to each team involved. One grant, made possible by Santander Bank, pairs RIT with Universidad del Pacifico in Lima, Peru. The aim is to internationalize their hospitality and business curricula through the integration of a two-week bi-directional, faculty-led exchange in a course on the food and beverage supply chain. During their time abroad, students will visit companies to examine regional best practices and interact with industry representatives from food and beverage producers, suppliers and retail operators. Through this program, students will develop projects to share the learned global practices with public and private sector industry and trade organizations in the region. Wegmans and Constellation Brands have both committed support for the educational programming through guest speakers and facility visits when the Peruvian students come to Rochester. Muhammet Kesgin and Rick Lagiewski, assistant professors from the hospitality and tourism management program, will lead RIT’s efforts in the partnership. RIT was one of 26 new Innovation Fund teams in 17 countries and 24 U.S. states sponsored by the Santander Bank grant. The second grant, sponsored by the Colombian Institute of Educational Loans and Studies Abroad (ICETEX) and the U.S. Department of State, will partner RIT with Universidad Autónoma de Occidente (UAO) and Corporación Universitaria Comfacauca (UniComfacauca). The grant will help the universities expand a project-based engineering program to provide students with product development skills. RIT students will work collaboratively with UAO and UniComfacauca students to design a product architecture proposal, build and test the design, then implement their final solution in Colombia. RIT is part of one of 11 new higher education partnerships between 34 higher education institutions in the United States and Colombia sponsored by the grant. Associate Professor Marcos Esterman from the Kate Gleason College of Engineering is leading RIT’s part of the partnership. Earlier this year his undergraduate engineering students collaborated with students from UAO to develop a solar-powered 3D printing system intended to help residents of a Cali neighborhood at high risk of attracting youth to gang activities to develop marketable skills in advanced manufacturing. The implementation was a success, so he’ll use the project as a model for future collaborations funded by the grant that will address different challenges facing the region. To learn more about RIT’s international faculty-led programming and initiatives, go to www.rit.edu/academicaffairs/global/lead-faculty-led-program.